Today's story was about weather. One of the tenets of local TV news is weather affects everyone - doesn't matter where you live, how much money you make, how many kids you have. It rains on everyone equally. Therefore, anytime there's unusual or extreme weather, TV stations kick into high (higher) gear. Today we had a viewer email in a cell phone photo of a funnel cloud. FUNNEL CLOUD!!!!!!! Those aren't too common in the Bay Area. Moreover, this viewer is a fan of our morning meteorologist, Roberta Gonzales, so she emailed it only to us. Immediately the first thought in the minds of all the newsroom managers was Exclusive! We can do a story no one else can. While it might seem trite, it's a well-founded strategy. Focus groups say the same thing about local TV news over and over again: "You guys are all the same. You tell the same stories. You have the same equipment. You even wear the same royal blue rain coats in bad weather." So any time a local TV station can tell a story that distinguishes it from the rest, it's going to happen. Our interview subject was lively and engaging and the story turned out to be a fun one - not all that significant, but definitely a chance for us to tell a story no one else could. The traffic is terrible in the Bay Area, worse than last year and worse than when I lived here in the 2000s. Because one is so often caught in traffic jams, the temptation to look at the cell phone is truly irresistible. It's impossible to look away. And it's also stupid and dangerous. Interestingly, because I can always get to places quickly in Syracuse, it doesn't seem to be as big of a problem - I can check email after I arrive to my destination. But because I'm stopped on the road so much in the Bay Area, the phone seems more tantalizing. MMJs have a gazillion things to do already, but trying to multi-task behind the wheel is a recipe for disaster. Get a hands-free earpiece and keep your eyes on the road. Syracuse University's Newhouse Broadcast and Digital Journalism students should be proud of their new $18 million studios. 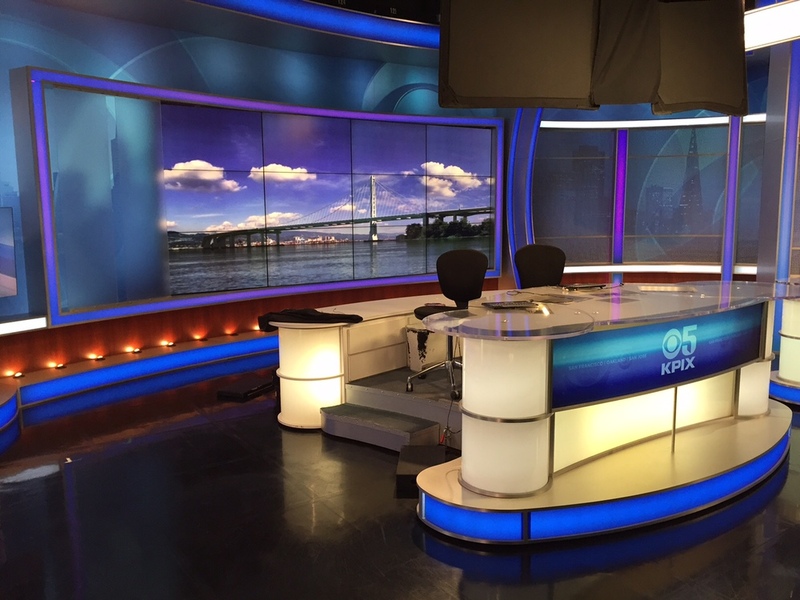 The KPIX 5 studios in the fifth largest market in the country are larger, but that's about it. Same anchor desk, same green screen, same robotic cameras, the works. Click on the photos to advance the slideshow. Weather rules local TV news. Get used to it. If you don't like standing in the rain, the sleet and the snow, then this isn't the job for you. Exclusive rules local TV news. Stations are desperate for ways to be different. News directors value reporters who pitch exclusive ideas. Personalities make a difference on TV. We got the exclusive story today because the viewer felt a real connection with our meteorologist. Put down the damn phone when you're driving. Get a hands-free device. It's just not worth it, no matter how pressured you feel to do just one more thing.